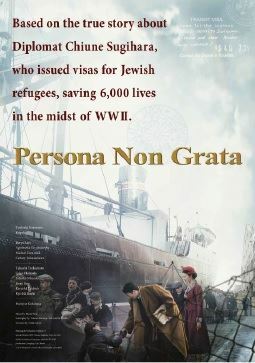 4:00pm - 6:30pm Film Screening of "Persona Non Grata"
Chiune Sugihara (1900-1986) was a Japanese diplomat who served as the Vice-Consul for the Empire of Japan in Kaunas, Lithuania. By issuing 2,139 transit visas to Japan during World War II, he is believed to have saved the lives of more than 6,000 Jews. Sugihara risked his life and career to issue these “Visas for Life”, but by doing so, he created a strong and lasting bond between the Japanese and Jewish people. In memory of his legacy, the film “Persona Non Grata” was released last December. There will be a unique screening of the movie, with a number of esteemed guests including: Nathan Lewin, who was 4 years old when he received one of Sugihara’s visas; Akira Kitade, the author of “Visas of Life”; and Oriha Sugihara, Chiune’s great grand-daughter. We hope you can join us for this very special event. Mr. Akira Kitade, author of a "Visas of Life and the Epic Journey"